The WPUM Personal data add-on is required for this specific functionality. A new "Personal data" tab is added to the account page. The user will be requested to type his current password before requesting an export of data or before requesting erasure of personal data. Upon successful submission, requests will be logged under " Tools -> Export personal data" and/or "Tools -> Erase personal data" within your admin dashboard from where you can manage requests. This add-on follows the way WordPress itself provides integration for privacy tools. This addon will evolve alongside WordPress when new privacy tools will be introduced. 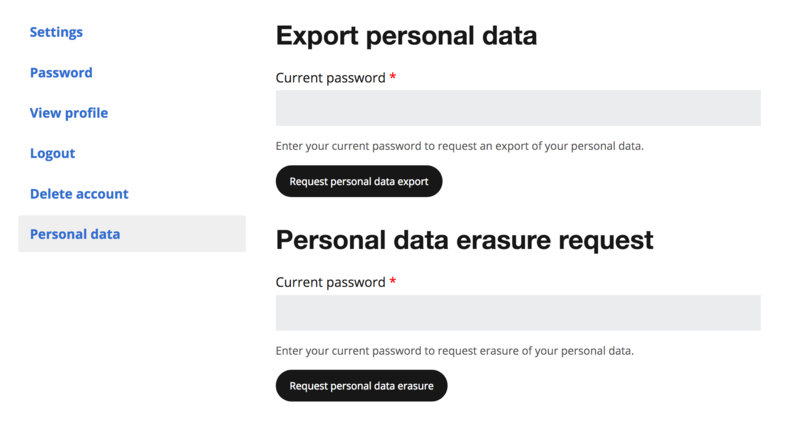 When requesting an export or erasure of personal data, the user will receive a confirmation request email with a special link that once clicked, will mark the request as confirmed in your dashboard so the administrators can either send an export of data or erase personal data.